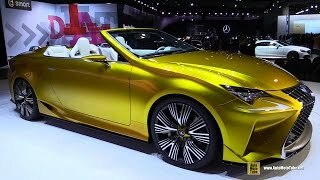 Already full of enthusiasm with lately debuted Lexus LF-LC 2012 people get a treat to have the convertible concept of the sports coupe named, Lexus LF-C2 Concept 2014 at the Los Angeles Auto Show. 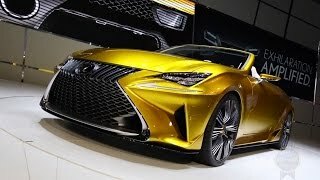 Though the concept LF-C2 carries high similarities with its coupe concept and the already production RC F, the model is definitely a step ahead of being just a regular convertible. Let us have a closer look at all its features and incorporations. The interior of Lexus LF-C2 Concept 2014 comes with leather surfaces carrying white and gray color. The spacious cabin gets enhanced by the long, extended center console drenched in the same color as that of body. A centrally located video monitor and Lexus’s infotainments system steals your eye-balls with same shades of white and gray. Beside the central air vent an analog clock resides, which from our perspective undoubtedly stands as a superfluous addition. 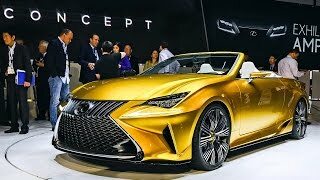 The LF-C2 Concept gets enough of space inside and well as above (being convertible) and thus it gets an additional star in comparison to previously mentioned both models. The exterior of Lexus LF-C2 2014 comes with stunning looks. The queue of appreciation begins with the three piece LED headlamps and larger spindle grille located amidst them. Daytime running light glued on front fascia looks complimenting with their L Shaped design. To our surprise watching front fascia of LF-C2 Concept 2014 from various angles gave us different experience and joy. The main difference in this concept when compared to Lexus LF-LC is its missing roof-top. Though not talked about in the concept release but we have firm belief of production model to release with a foldable roof. 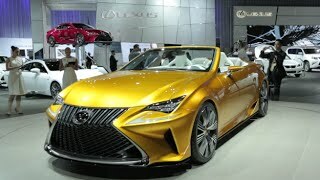 Till date there is no word from Lexus in context to performance of Lexus LF-C2 Concept 2014. Though anxious car lovers with its very release started speculating about the engine to be used in LF-C2 Concept. With its sporty looks and classy interior perceptions narrate befitting something around a 5.0 liter beneath hood. However we too to an extent keep the same thoughts, as the current line up comes with a 3.5 liter V6 and such an awaited model carrying sporty looks deserves something above it. Still without giving any final figure for now, we would like other wait till the time company releases some stats.